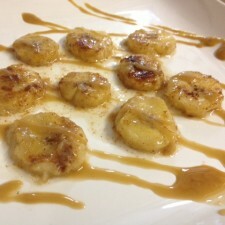 As a typical Pinterest browser I recently discovered a delicious recipe for “fried bananas”. I’m not a huge banana fan but my son loves bananas, so I like finding new recipes for him to try. This recipe would be great for weekend breakfasts on top of warm pancakes or french toast. The recipe is really simple and most of the ingredients are probably already in the house. In a medium sized skillet place heat on medium and add in coconut oil. Slice bananas, about 1 inch thick, and place in hot pan. Sprinkle with cinnamon and flip after about 2 minutes. Sprinkle other side with cinnamon and continue to fry for about 2 minutes. Remove from heat and top with sugar-free caramel drizzle. As I stated previously this would be delicious on top of pancakes or french toast with the added caramel sauce. This would also be a good after school snack for the kids during the week. I really enjoyed this recipe because it is a great sweet treat without the added sugar. The coconut oil pairs well with the sweet taste of the banana and cinnamon. 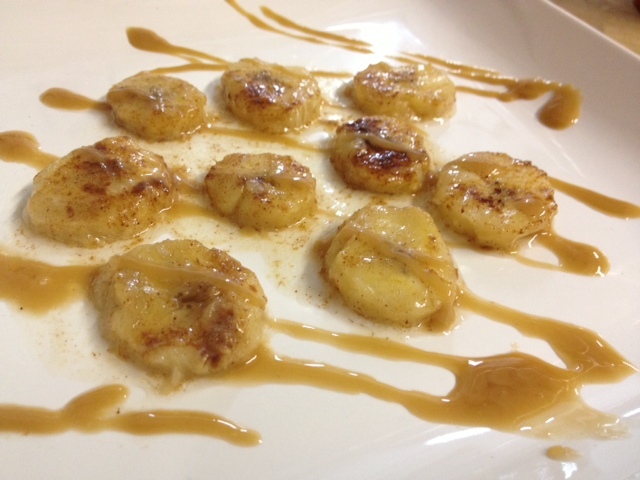 The caramel syrup is so delightful with the warm bananas and your not adding extra sugar into your diet! This is also a great way to use bananas that may be getting a little soft. What is your favorite sweet treat that isn’t really that bad for you?